As I was swinging past Valumart this morning I noticed two new bike racks and remembered Jonathan’s comment telling of his advocacy to First Gulf. Yep, they’re beautiful alright. Feel free to let First Gulf know that you approve of their decision. Positive reinforcement never hurts. With encouragement, maybe they’ll help convince the city to install some ring & posts on the sidewalk at the South-West entrance as well. Great to see! Although I’d take the rail in that picture compared to what some of our grocery stores have. One of the grocery stores I go to often (Food Basics – north end) added a bike rack last year…Of course they had little choice as so many people cycle to it. Unfortunately the Food Basics in the other end of the city you can’t park anywhere except locking your bike to a shopping cart. Are you referring to the Food Basics at Erbsville & Laurelwood? The only racks I’ve seen there are the post&ring ones by the Subway entrance. I assume those were put in by the landowner, rather than by Food Basics. Looks like a decent rack. 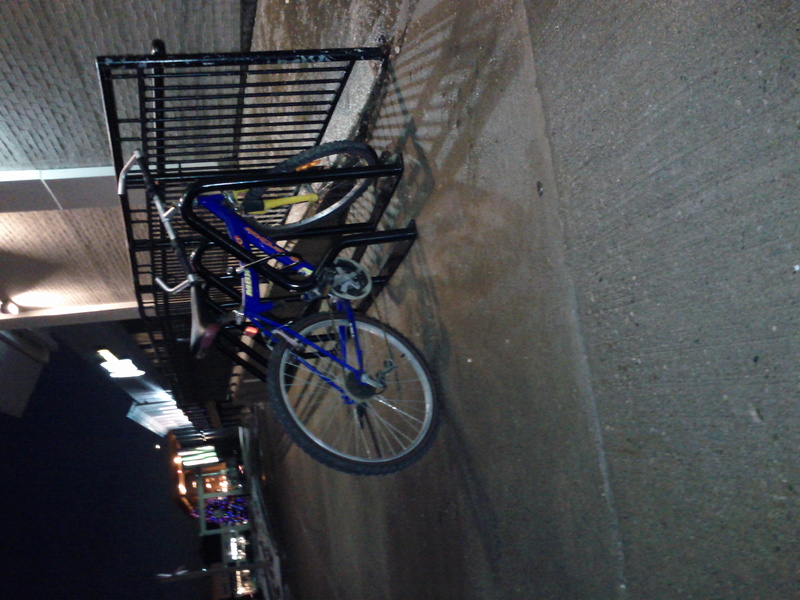 The food basics on highland has a useless fence in front of nothing in particular that makes a great lockup, way better than the actual bike rack that isn’t even bolted to the ground. Sure they *look* great. Have you tried to use one? They are too close to the building to lock a frame to the bike rack using a U-lock. Locking my tire does not cut it. Sorry. Next Next post: Do other cyclists get this kind of stuff as gifts?